Seymour Gardens has been published from a 3'x6' original oil painting. In 1989, artists Wendy Schaefer-Miles and Kevin Miles were commissioned to paint a piece for the new medical facility Gundersen Clinic, in Wendy's hometown of Whitehall, WI. 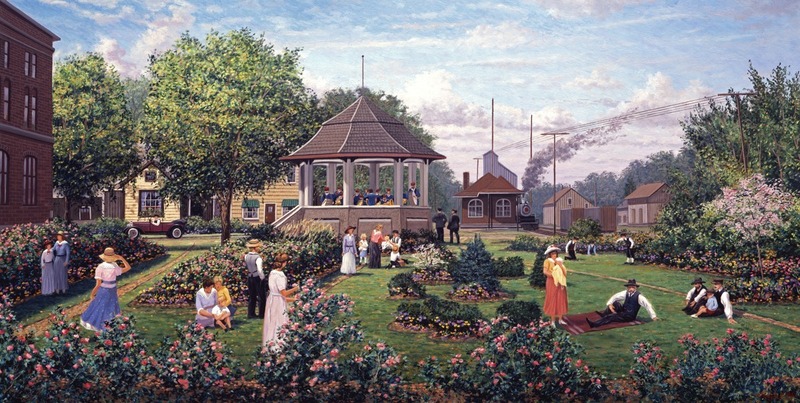 The artists' imaginative view portrays a day at the garden park that once surrounded Whitehall's Bandstand. The magnificent gardens which were developed by the Women's Civic Association are long gone, but the bandstand built in 1915, still remains. The popularity of the painting has inspired the modern day citizens of the town to restore some of the garden to its past glory. Call, Email or Click on the Buy it now button below. Mini print open edition in print on demand. Collectible gifts available. On the Home page select Collectible gifts.